So far we’ve collected $295 of our parish’s goal of $1,400 for the 2011-2012 Stewardship Appeal. If you have not received a mailing from the eparchy please contact the rectory so we can supply you with the pledge paperwork. If you would like to be chairperson for the appeal please contact Father Sid. Please help Bishop John by pledging funds to his important projects. The Knights of Columbus Brunch is today, Sunday, January 22, following the Divine Liturgy. Some of the men bought back pierogies from Rudy’s and kielbasa from State Meats, both in Parma, Ohio. Come and enjoy this authentic eastern European food. The Knights request a minimum of $5 per adult to help defray the cost. There is no Patristics Theology class this Tuesday. It will resume on Tuesday, January 31. We’ve received 2 new testimonials in the last 2 weeks as a result of Ancient Healing Service. Thank you to those who participated. Don’t miss the next one on Wednesday, January 25 at 7 PM. The new Jordan water was blessed on January 6th. It is our tradition to bless all parishioners’ homes in the few weeks following the celebration of Theophany. Please let the rectory know when you’re available to have Fr. Sid bless your home. Use the House Blessing form in the back of the church. Fr. 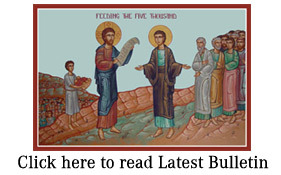 is available to celebrate a liturgy during the week on behalf of your special intention. It can be for a new job, healing, prosperity, anniversary, birthday, deceased member of the family, etc. A typical stipend is $10. Call to arrange a liturgy that is at a convenient time for you so that you can attend.